Are you ready for some football? I can tell you I am!! 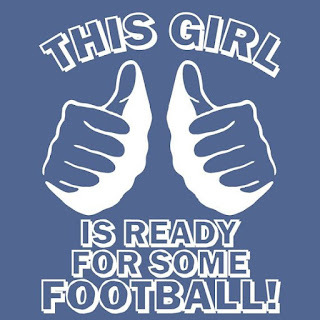 I am more than excited to start another fun season! 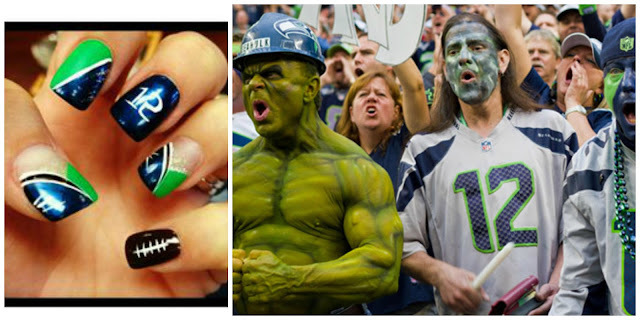 My football loving family is too!! Yes, we are ready! Jersey's are on, green and blue hair is showing up everywhere and manicures have changed from French to our team colors!! 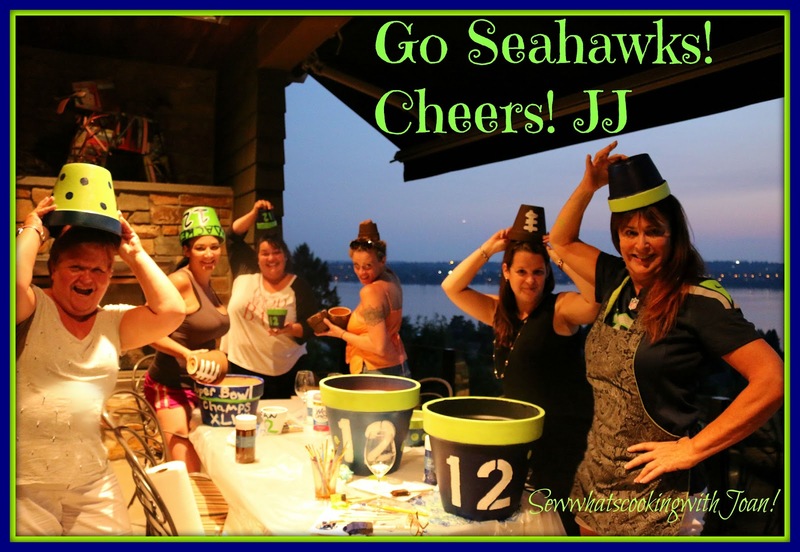 The Seattle fans are not only the loudest fans, they are over the top crazy in love of their team....heck, when a fan has to put the garbage can out, they put their jersey on, then go to take the can out!! Fans of the Seattle Seahawks helped the American Football team reclaim the hotly contested world record for loudest crowd roar at a sports stadium on a Monday night as noise at the CenturyLink Field reached an ear-splitting 137.6 decibels during their game against the New Orleans Saints! We are crazy n love with our Seahawks! "Paint, pot and vino" party! And boy oh boy, did we have some fun!! Aren't these pots cute? Would you like to do this? If the answer is yes, here is some instructions that may get you started. I found my information on Wiki How and have added a few other tips and of course my pictures! Clean the pot in warm water and let it dry. Brand-new pots are often coated with a thin layer of dust. Some may even have price tags and stickers. All of these can prevent the paint from adhering properly. To fix this, start off by soaking the pot in a container of warm water. Use a stiff brush or coarse sponge to loosen any grit or dirt. If the pot has any stubborn price tags that won't come off, leave the pot sitting in the hot water for about an hour, then continue scrubbing it Once clean, set the pot in a sunny spot and let it dry. Wipe the pot with a damp cotton cloth and let it dry. This will remove all traces of dust and grit. Let the pot dry completely before proceeding. Seal the inside of the terracotta pot and let it dry. I use a special interior pot sealer, I bought at Michael's. Or, use Acrylic sealer. 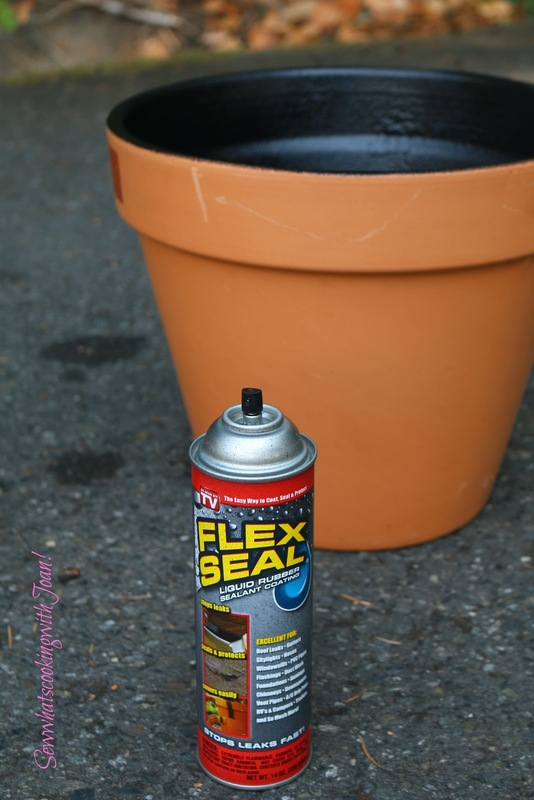 Shake a can of acrylic spray sealer until you can hear it rattle, then apply a light, even coat to the inside of the pot. Be sure to cover the bottom and the sides. Terracotta is porous, so it will likely soak up the first coat. This is normal. Simply wait for this coat to dry before applying another coat. You may need between two or three more coats. Make sure that you allow each coat to dry before applying another. 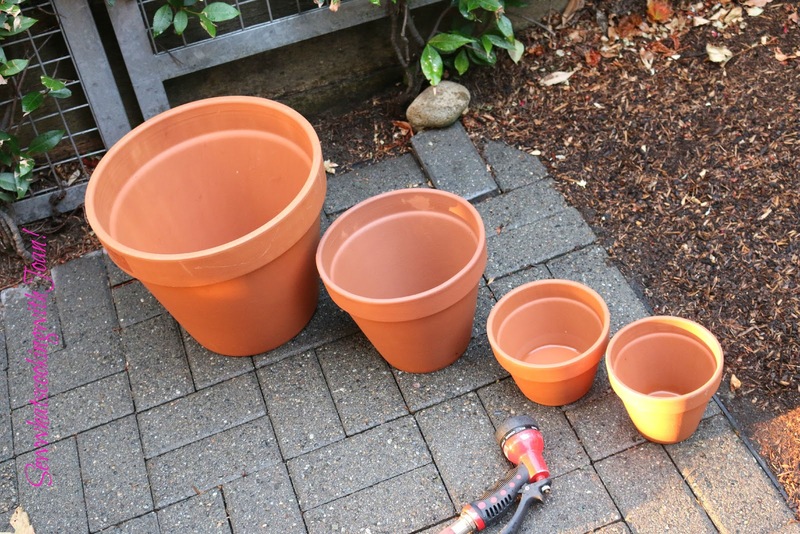 The sealer is important, because it will prevent moisture from leaching through to the outside after the pot is planted. You can use any finish for the acrylic sealer: matte, satin, or glossy. Be sure that the can states that the sealer is waterproof. For a more sophisticated look, paint the inside of the flower pot black first, then seal it. If you are going to paint the entire pot one, solid color, then you will need to prime it. Hold the can 6 to 8 inches (15.24 to 20.32 centimeters) away from the surface of the pot, and apply a light, even coat. You can apply a second coat, if necessary, once the first one dries. Applying some primer will not only help you achieve a smoother finish, but it will also prevent the pot from soaking up any paint. 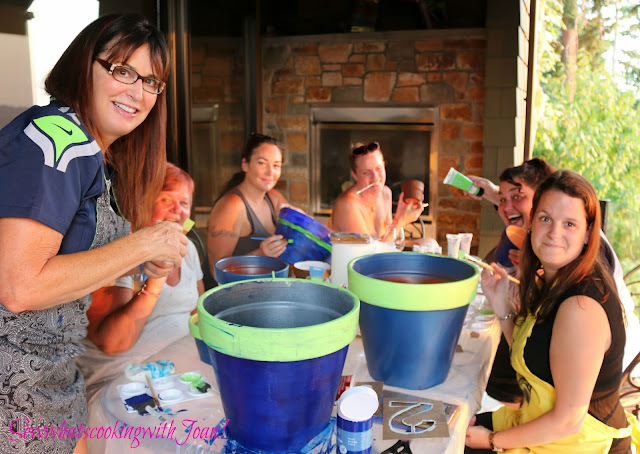 Metallic, pearlescent, and glittery paint will add some sparkle to your pot. These paints will need to be sealed with a glossy finish to preserve their shine and luster. 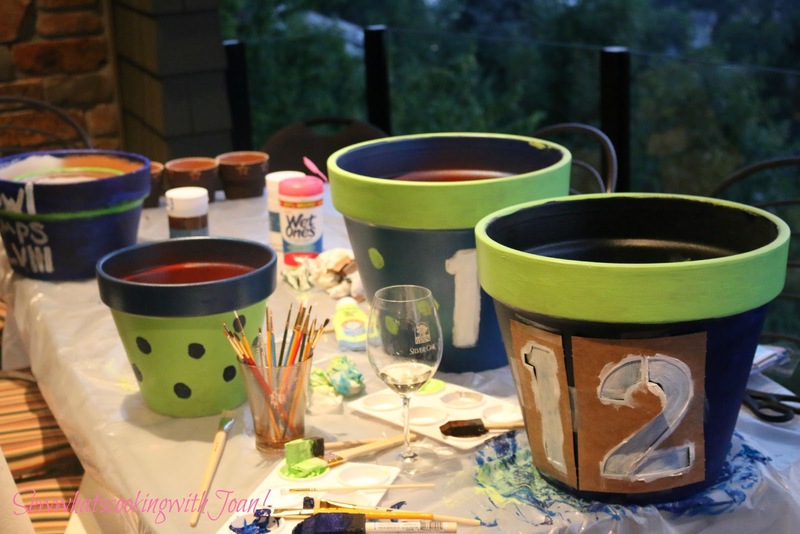 You can create a completely customizable pot with chalkboard paint. If you choose to use chalkboard paint, you won't need to seal it. Sealing a chalkboard finish will prevent it from working like a chalkboard. Solid colored paints can be coated with matte, satin, or glossy sealants for different finishes. Textured spray paint is also available. You can make your terracotta pot look rustic with a coarse, stone-like texture. My family- From left is JJ, Eva (my son's mother-in-law), Allie (my niece), Heather (my niece), in rear, right, Stephanie(my niece), and Eva (my daughter-in-law). Apply the first coat of paint and let it dry. If you are using acrylic paint, you can use a flat paintbrush or a foam paintbrush. If you are using spray paint, hold the can 6 to 8 inches (15.24 to 20.32 centimeters) away from the pot's surface and spray on a light, even coat. Let this coat dry before applying another. This can take anywhere from 15 minutes to a few hours, depending on the manufacturer's recommendations. Apply more coats, if necessary. Once the first coat has dried, you can apply a second or third coat. Make sure to let each coat to dry completely before adding another one. Add designs using stencils. 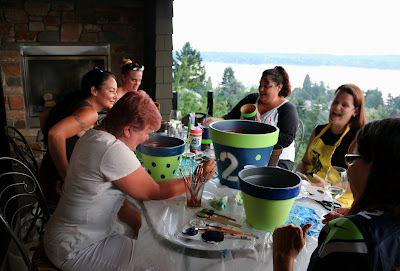 Purchase some adhesive stencils and stick them onto your pot. If you cannot find any adhesive stencils, then you can simply tape them onto the pot using painter's tape. Paint over the stencil using acrylic paint or spray paint, then remove the stencil. You can use any color you want, but contrasting colors or metallic colors work best. Paint delicate designs free-handedly. If you don't like using stencils, you can paint the designs on using oil-based paint pens or a thin paintbrush. I used a squared off paint brush to make my dots, I used a twirling method to create nearly perfect dots. Sealing your pot- Prepare your work area. Because you will be working with spray-on sealers, you will need to move to a well-ventilated area. Outdoors is the best. If you cannot work in a well-ventilated area, then make sure to have a window open and take breaks often so that you don't feel lightheaded. Consider switching a fan on and turning it away from you. It will steer the paint fumes away from you. Make sure that your work area is free of any dust or debris, especially if you are planning on working with a glossy sealer. Turn the pot upside down and set it on a tall cup or can. Make sure that the cup or can you are using is thin enough to fit inside the pot, but tall enough so that the pot can rest on top of it without touching your table. You are creating something that looks like a lamp or a giant mushroom. This will allow you to coat the entire surface of the pot, including the bottom. Choose a matte finish for a natural look. A matte sealer will give you a dull finish, similar to the original texture of the pot. This will work well for designs that you hand-painted onto a bare pot.Choose a satin finish for a neutral, subtle look. A satin finish will have some gloss to it, but it will not be as reflective or shiny as a typical gloss finish. Do not seal chalkboard paint. Instead, let the paint dry for 3 days, then prime it by covering the entire surface with a piece of chalk. Wipe the chalk off with a damp cloth. You can draw designs on the pot, or you can write the name of the herb or plant you are putting inside the pot. 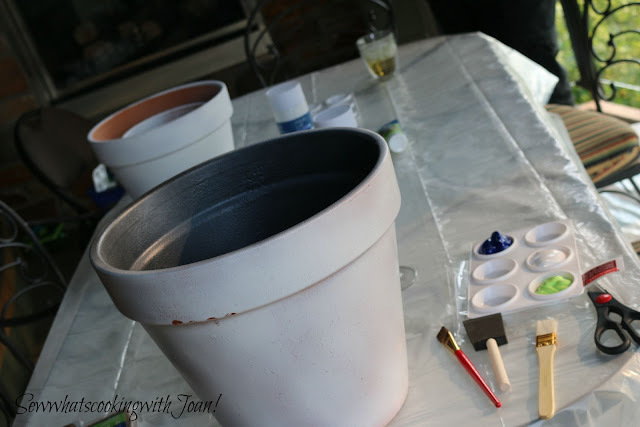 Seal the pot with a coat of clear acrylic spray paint and let it dry. Hold the can 6 to 8 inches (15.24 to 20.32 centimeters) away from the surface and apply a light, even coat. The sealer protects the paint from scratches, adds durability and makes the pot easier to keep clean. If necessary, apply a second coat once the first one dries. Be sure to get the bottom of the pot as well. Let the sealer dry completely before proceeding. Take the pot off the cup or can and sand any drips. If you see any drips along the rim, take a fine, 220-grit sand paper and lightly buff the surface until the drips are gone. Be careful not to scratch the paint off. Spray the rim of the pot. Once you are done sanding, wipe the dust off with a damp cloth, and apply a light coat of sealer. Be sure to get the top of the rim, and the inside of the rim. Wait until the sealer has dried before applying a second coat. 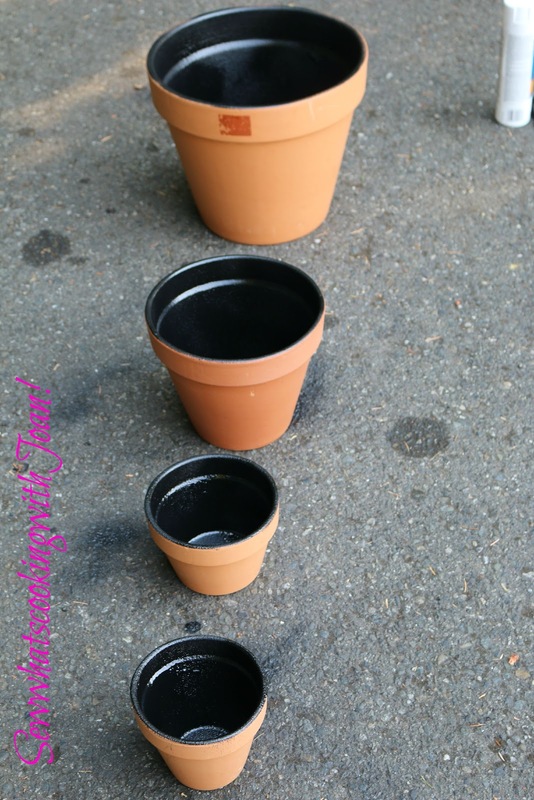 Set the pot aside to dry for at least 2 to 3 days before planting. 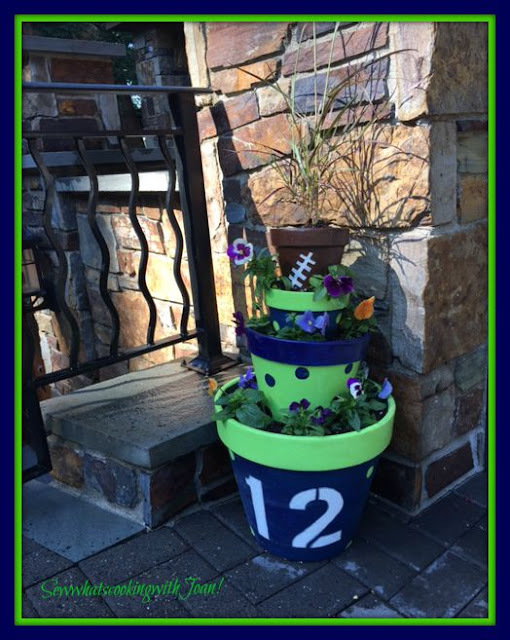 If you plant too soon, the paint may not be fully-dried yet. The moisture form the soil may cause the paint to bubble, crack, and peel away. 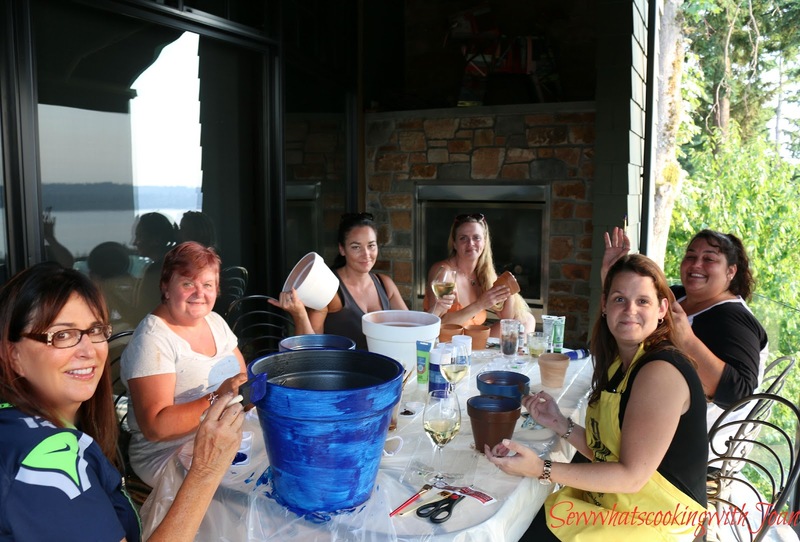 You can also paint an old terracotta pot. Soak the pot in warm water for about an hour before you scrub or sand the pot. If the pot is badly soiled, add a small amount of bleach. Rinse thoroughly, and be sure the pot is completely dry before applying paint. Use light, thin coats when priming, painting, and sealing. Using too-thick coats may result in pooling, dripping, or improper curing/drying. Transportation themed quilt- so adorable!